Hikari Tropical Algae Wafers were specifically developed for the hard to feed plecostomus and other algae eating bottom feeders. Contains high levels of vegetable matter that algae eaters prefer and love! Promotes proper growth and desirable form in most herbivorous species. Contains higher levels of vegetable matter and multiple algaes that plecostomus and other algae eaters prefer. Sinks rapidly and retains its shape allowing less aggressive species ready access. High in stabilized vitamin C to reduce stress and build immunity to disease. Complete and balanced nutrition. Will not dissolve or cloud the water. 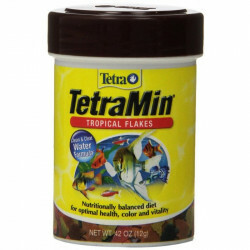 Contains pure-cultured spirulina and chlorella algae to help your fish look their best. Great for saltwater fish too! Daily diet for Plecostomus and other algae eaters, including marine herbivores. Pet Mountain is proud to offer discount bulk pet products. Feeding Directions: Feed only the amount your fish will completely consume within two (2) hours. Some tropical fish resist a new type of food when changing their diet, continued use will ensure acceptance. Algae Wafers™ discs can be broken into smaller pieces, if desired, for feeding other algae eating tropical or marine fish. I have 3 large upside down catfish and 1 large comet and they love the Wafers. It's like candy to them. When you are feeding a 25 year old, 22" Pleco, those little expensive packets of algae tabs just don't do the job. Buy the 2.2lb bag like I did Thanks! I once had a Plecosamus that was so spoiled on Hikari Algae Wafers he would not eat any thing else. Nowadays my Goldfish love them as much as my Pleco. As anyone would agree, buying in bulk will save you money. This is a good example. I use a lot of these wafers. I have purchased this 2.2 pound bag locally which cost me $27.00 more. Look at the cost savings. The only complaint if you want to call it, is that it took about 2 weeks before I got this order. Other than this Pet Mountain would save you a lot if you are willing to wait. I generally place an order a couple times a year. I just bought some algae wafers for my hairy nosed plecos. It was my second order, the first being a tub of fish food. Both orders were delivered very quickly, and exactly what I had ordered. The fishies are all very happy with their new food, and so am I!! I will continue to order the food and other great products at great prices from Pet Mountain. Great Product and great selection! Having around 50 Cory Cats in my 7 tanks, I would not be without this product. And Pet Mountain has the best prices on this and ALL of their aquarium supplies. I keep writing reviews on all of my purchases, but the bottom line is I only order from Pet Mountain because of their prices and fast shipping. Plecos love it after it gets a little soft in water. 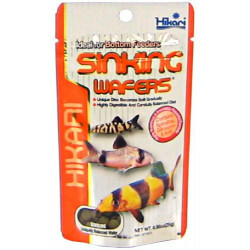 Hands down my fish prefer Hikari vegetable wafers to any other, and I prefer the prices here to every pets store! 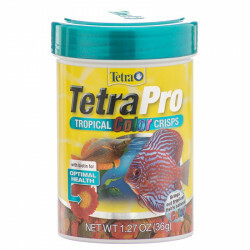 Won't regret this purchase and your fish will have beautiful coloration and live long lives due to the quality diet, plus less waste because better absorption of quality ingredients. A win-win for all! 5 stars for quality and value! I raise Bristle Nose Plecostomus. They are big algae eaters and normally - an aquarium doesn't produce enough algae to support a large amount of Pleco's. This food is an excellent value and a valuable supplement to their diet. My sally lightfoot eats this with gusto. Coral beauty seems to like to nibble on them as well. All of Pet Moutain prices cant be beat but the shipping is a tad too slow. I highly recommend this product to anyone who feeds a lot of algae eaters in a long run. I have used it for several years. I can not imagine how much more I would have to spend on this if it was not available in bulk. At the local retailers, each bag of 4.4 oz is about $6 or more. My Pleco loves these wafers! I have a 12" Pleco and as soon as these wafers hit the sand, he goes straight for them and starts eating. Since I got these wafers for him, he doesn't even try to chase the Oranda anymore! These algae wafers are great! Best wafers for fish or bottom feeder. All my fish go crazy for them. All the bottom feeders love these!! 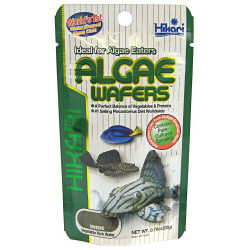 These waffers are great for the Cory"
All my herbivores love both these and the mini-sized wafers. They work well for my Pleco, Algae Eater, and Gobies. My catfish love me so......I break up a couple wafers for my three tanks and it's Thanksgiving for my fish. The food sinks quickly to the bottom and within seconds the hoards are busy eating, to my delight! I first bought these algae wafer for cory cats and oto cats. Then I found out many other fish eat them too. Dwarf Gourami, Platy, German Blue Ram, Cardinal Tetra, the all would nip on the wafer. While some other fish who refuse to nip on the food from the bottom will eat the debris caused by the bottom feeders. It is a fun scene to watch a tank full of community fish surrounding one piece of algae wafer. My plecostomuses and blood parrots love it! 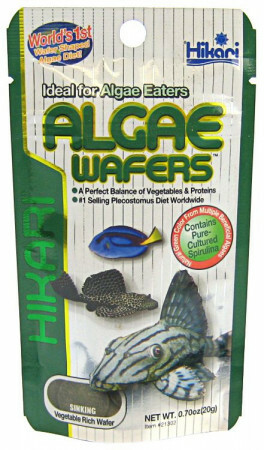 I have been feeding Hikari Algae Wafers to both my plecostomuses and blood parrots for years. It seems like they can not get enough of it. The blood parrots eat all the wafers first before they eat the other food. my silver dollars loves these! I buy these for my Silver Dollars and they love them. My Silver Dollars are average 5 inches long now. my fish are fighting for this algae wafer! Excellent product; my algae eaters love it...I love the high nutritional quality of the wafers that Hikari puts out. I have used Hikari Algae Wafers for more than 3 years and my Clown loaches just love it. This is a pretty good price over the price in my local pet store, and my bottom dwelling catfish really enjoy this product. I bought this for my Otocinclus but my shrimp love them too. After having fed my common Pleco Wardley Wafers for 18 months I wasn't sure about switching. However 'Jonah' leaves his hiding place in a rush to get to his daily ration. I certainly like the thicker dimension of these pellets and when available will not return to Wardley's.